If you run an interactive team, marketing agency, or VC firm you’ve considered developing or backing development of a mobile app. It would be silly if you hadn’t. Since 2008, the year the App Store opened, over 100 billion apps have been downloaded and more than 4 million apps are currently available in the App and Google Play stores. So you could be forgiven for assuming that developing a mobile app is a cost of entry for running a business these days. But if this is a decision you’re facing right now you have very good reason to doubt the value of incurring the expense. Not because you don’t need a useful mobile presence, you do no matter what your business offering, but because requiring customers to install an app introduces potentially unnecessary customer experience hurdles. I know unless I think I will use a service every day I won’t go through the trouble of downloading an app, no matter how many times I get asked (looking at you, Yelp). If anything, my focus on my smartphone has been to get rid of apps I downloaded rather than adding new ones to reduce clutter. According to comScore’s latest mobile app report, most US smartphone owners download zero apps in a typical month, and year over year downloads have declined 20%. Add to that the very real impact of Google’s recent decision to penalize websites that push mobile web traffic to download an app, and the Android release last year that provided enhanced mobile web experiences and taking a big pause before investing in development of a new iOS or Android app is more than warranted. All that being said, there’s no denying that online mobile experiences are dominated by apps. Last year TechCrunch reported that 85% of time consumers spent on smartphones was spent in apps. But of that time, only 5 apps saw heavy use. Which apps took up that time varied from user to user, but for most that dominance in mobile device usage is driven by the most popular social network, email and news apps. As the comScore graph below shows, although most of us have a wealth of apps accessible on our phones by and large we use fewer than five on any given day. After that no apps, on average, take more than 3% of our online smartphone or tablet time. So unless you’re lucky enough to be one of those top five performing app providers, odds are your app isn’t getting much airplay. If your app is not or is not expected to become one of the top apps for your audience then the choice to invest or not in developing an iOS and/or Android app should give you pause. 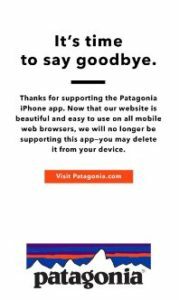 Of course that doesn’t at all mean that you don’t engage with your audiences in the mobile space, just that you can consider foregoing something that conventional wisdom still assumes is required. The mobile web has come a long way since the first days of smartphones, when, before the Apple App Store was introduced, Steve Jobs was eager for owners of his new iPhone to get online. Back then mobile browsing platforms didn’t provide the experiential opportunities that last year’s the latest releases of Android and iOS offer. Now developers have the ability to deliver experiences as immersive and flexible as your favorite apps through the mobile web, and have just one platform to maintain rather than two for iOS and Android. Last year Benedict Evans summarized the business driver for choosing native over web to just one question: “do people want to put your icon on their home screen? If the answer is Yes, go native. If No, go web.” Recently one major brand, Patagonia, decided to shut down the iPhone app they launched in 2010, stating that “now our website is beautiful and easy to use on all mobile web browsers” and inviting users to delete the app from their devices. There’s no question that new business solutions will continue to be introduced that warrant a dedicated app to facilitate transactions, provide offline use, and to take advantage of native experience opportunities. But those experiential advantages alone, such as they still are, no longer justify the expense. Posted on July 11, 2016 July 12, 2016 Categories Interactive Marketing, Mobile, Mobile Apps, Mobile Web, Product ManagementTags android, apps, ios, mobile, mobile webLeave a comment on Thinking of Developing That App?? Anyone who has visited the Ambility blog or scanned our post topics knows that our team is fairly obsessed with mobile screens and how we interact with them. But recently we’ve become obsessed with another kind of screen. cost. Add to those factors the increase in media value that such placements enable above static media assets for owners of the physical spaces and we should expect to see dramatic increases in the number of screens we experience outside the home. 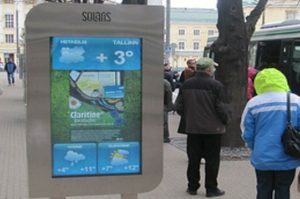 Beyond public spaces, expect to see more DOOH screens in office parks, schools, hospital complexes, and retail stores as well. Those spaces, too, are seeing dramatic increases in the number of digital screen installations driven by intense competition to enhance consumer/brand experiences. Most out of home digital screens currently in use are broadcast experiences only that have immense media value but are limited in their ability to message individuals. Even the few direct response, large format screens in Times Square that allow you to post your selfie for all of midtown Manhattan to see are leveraging a pretty limited set of consumer needs; namely the need to broadcast your selfie to midtown Manhattan. Instead it’s a different kind of out of home digital screen that is getting the attention of the Ambility team: those screens that provide the potential for one-to-one or one-to-a-few interactions and can lead to highly personalized, high-value consumer experiences. 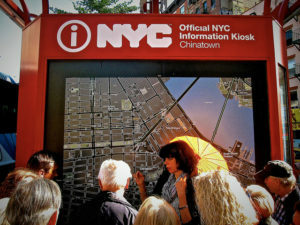 New York has undertaken a huge effort to replace its largely defunct collection of phone booths with a network of installations that offer WIFI connectivity, two large-scale display screens, and a third interactive screen. 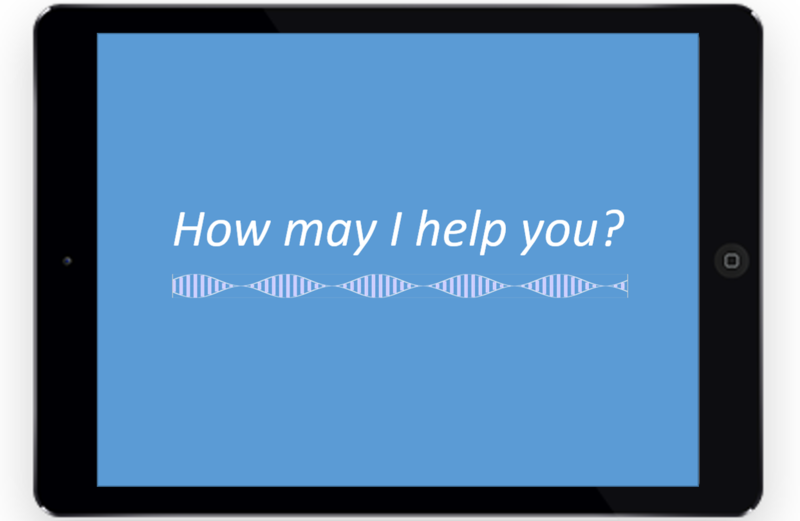 The interactive screen (an iPad) is housed just above waist level and includes a dedicated user interface providing access to city services (think 311 and 911) and free nationwide video calls. It’s this type of digital out of home screen that got us thinking. Internet connectivity links us to billions of nodes of content and services at all times. But for now, at least, we are creatures capable of occupying only one physical space and one physical time. Data and design experts spend countless hours working to anticipate what we will want at any given time based on our demographic profile, browsing and purchase history, and our cohorts. But there is growing recognition that where we are when we’re outside the home or office is as much a determinant of what we are looking for as all of that profile information combined. The things I’m looking for when I’m browsing the internet from my couch have almost no resemblance to what my wife and daughter are seeking, but when each of us is wandering around town at 1pm on a Sunday we’re probably looking for largely similar things: something to see, a place to eat, or a shop. If we each walk into a train station, hospital, or retail store the options are more limited still. In other words, the potential for digital out of home experiences to provide relevant, valuable messaging and services for even anonymous users is pretty high. Large format digital displays that media planners covet have some inherent limitations in providing interactivity, but that could change. No one will look to book a restaurant reservation through a Times Square billboard but installations like the LinkNYC assets, transport information displays, or executions that leverage a small portion of a large display screen for interactivity could deliver broad access to more personalized location-based content. These in themselves would increase the media value of such installations (“Local Specials for You! !”), be great sources of insight for urban planners and marketers, and provide real value for consumers. To be sure, personal mobile devices are getting better and better at offering location-based custom content, but there are a multitude of reasons that location specific interactions offer advantages. Even ubiquitous platforms like Facebook and Google struggle to offer a consistent level of quality and detail, and well-designed displays that provide way-finding or other valuable content and services enhance a customer’s experience of a neighborhood, campus, or store. Publicly accessible digital assets offer immediacy, all categories of local offerings at once (no switching between Open Table, Groupon, and local tourism board offerings), and local attractions that tend to be featured on purely local online offerings. Municipal installations immediately become tourist information centers, educational campus installations become more comprehensive than any volunteer undergraduate guide, and hospital installations can tell you where radiology is and get you directions to the nearest pharmacy without taxing busy health professionals. Retail digital installations have the potential to broaden (or replace) shelf space and answer common consumer questions. No need to explain the difference between boot-cut, straight-leg, and skinny jeans when a digital screen can display it clearly. Paired with sensor technology, interactive screens can limit time in the changing room by showing how different items would look on the buyer. If these same out of home interactive assets could somehow know our interests, our likes, our shoe size, without asking for someone to enter that detail then it could get really interesting. The data that our phones collect have the potential to turn anonymous DOOH interactions into very targeted ones, and that need not be creepy. Explicit share requests that precede a near field communication interaction have the potential to be enormously valuable to visitors to a new city or a loyal shopper. My check-ins exhibit a pretty clear appreciation for water-front restaurants and cozy, old dive-bars. A customized itinerary for a new city based on those check-ins would be very welcome. And I know more than a few people who revel in discovering hidden specialty shops that match their interests. If they’re pushing a sale then all the better. As the economics of DOOH continues to decrease the cost of installation, and targeting technologies provide additional media value to the dynamic screens expect to see more of these experiences. 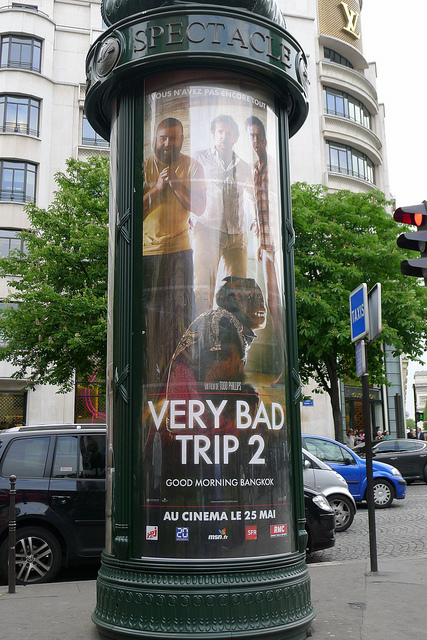 And don’t be surprised on your next trip to Paris if those famous old billboard kiosks can also direct you to that out of the way restaurant your friends told you about. Posted on April 15, 2016 April 17, 2016 Categories Content Marketing, Digital Out of Home, Interactive Marketing, Product Management, User ExperienceTags digital out of home, dooh, out of home, user experienceLeave a comment on The Third, Fourth, Fifth Screen Experience? Several times in the past this blog has discussed the work being done by large and small companies with deep pockets to usher in the age of voice-controlled computing. For the most part we have focused on the advantages consumers would realize from being able to leverage computing power with simple voice commands and the additional use cases connected devices would help satisfy as a result. As we continue to experience voice controlled devices weaving into our lives, two areas we haven’t discussed have started to come into focus – one an opportunity for insights and the other a challenge for product developers and barrier to widespread adoption. 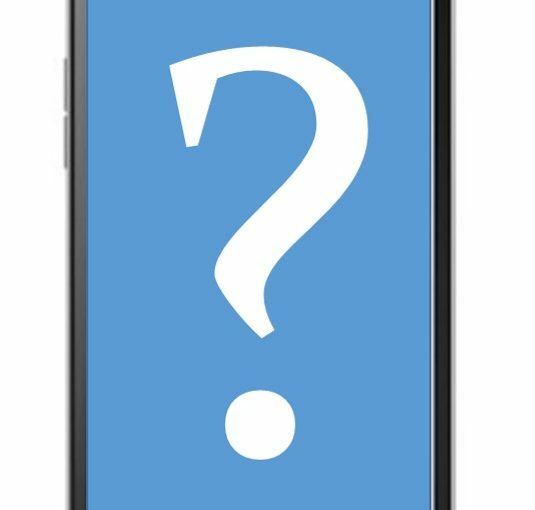 We have written several times about the advantages tablet devices offer over voice controlled computers like the Amazon Echo, that offer no display, as the richness of the response is multiplied by a screen where information, imagery, and videos can be offered in addition to audio responses. The Ambility team still believes this to be a significant advantage, but we have learned a great lesson from the Echo that we didn’t fully anticipate – that a wealth of use cases can be addressed very well through audio-only responses, and that these audio-based interactions offer brand new areas of insight for service and marketing providers to learn about their audiences. Another lesson we learned from interacting with Echo is that Siri and ‘OK Google’ are not really voice controlled computing platforms. They offer great doorways into web content end experiences, but once you get there you have to rely on tapping and swiping to get what you want. Over the course of a long weekend the Ambility leadership team found themselves turning to the Echo, by summoning ‘Alexa,’ more and more to satisfy simple queries and to help with tasks around the house. Our computers and mobile devices have long helped us settle debates by getting that easy answer, but how many of us turn to those devices to set a timer for the bread we’re baking or to dim the lights before dinner. With the Echo these were tasks easily completed, so by the end of the weekend we had forgotten where the light switches were and never cared to check for a timer in the kitchen. Beyond those tasks we also turned to the Echo to play music, create a shopping list, and check traffic, but it was the mundane uses of the device to help with dinner and manage the room’s heat and lighting that stood out (Tom’s Guide also identified tuning your guitar and having Alexa act as your exercise coach as good uses of the product). These are tasks that for most people are not completed using connected devices, and therefore have been unobserved by marketers and analysts. As voice controlled devices increase in their application and penetration into modern households, the opportunity (and burden) of harnessing this new data for insights will be vast. So overall the Ambility team liked the Echo and adopted its use for certain needs around the house quickly – to a degree that we don’t do with Siri or OK Google. Why is that? The obvious answer is that Alexa was always available. We didn’t need to grab a phone or tablet, hold a button and then ask for what we wanted, we only had to hail ‘Alexa’ and then make a request. The not-so-obvious answer is that the Echo “interface” is built for an audio only interaction and does not default to older, tactile mechanisms of interactive experience. Building “always on” capabilities is straight-forward enough (Siri allows it when your iPad is plugged in), but enabling audio only commands that interact with screen display is a far trickier change. Touch screen technology, historians tend to agree, was first developed in 1965 by E.A. Johnson at the Royal Radar Establishment in Malvern, UK, but it would be over forty years before mass audiences would have the chance to adopt them for anything other than highly specific interactions. Apple’s release of the iPhone in 2007 introduced intuitive standards of interaction that developers could then apply to web and application design. Siri, OK Google, and Soundhound’s new Hound product continue to enhance the ability for our devices to recognize voice commands and provide base level responses. And now there’s even a program for making your laptop respond with J.A.R.V.I.S.-type displays like those Iron Man relies on, but for now all of these offerings assume some level of touch or mouse based interaction. For example, Siri and OK Google respond to most queries with a standard search results page (SRP) with no way to select a result by voice command. Siri’s voice controlled messaging functionality works well but correcting or editing a message can be frustrating unless you resort to tapping and typing. The Amazon Echo so far has at least demonstrated that voice controlled interactions have some real usefulness and appeal. Even without a display screen the provision of always on audio computing is valuable. But the Echo hasn’t provided a way of navigating the rich and varied offerings the internet is so good at delivering. And a display screen would be a good start. Tackling that interactive challenge is far more complicated than programming a voice-controlled timer, but the Echo showed us that intuitive, voice-controlled computing solutions will be a welcome addition to consumers’ connected worlds. And the payoff for the company that establishes those standards, the solutions designers who leverage them, and the analysts looking for more insights into their target audiences will be massive. This blog has included several postings dealing with the skills and team design needed to deliver “digital” well for brands. From the implications of immersive content platforms (Return of the Product Manager) and the different perspectives of millennial staff (The Native Advantage), we’ve thought a lot about what evolving digital platform and ad tech capabilities require from strategy and delivery teams. These organizational design considerations are essential to evolving marketing teams as our channels and customer behavior continue to evolve at a pace never before seen in history. One thing that won’t ever change is the fundamental objective of marketing and communications teams across channels: to be persuasive about the products or services they are promoting. After we succeed in “interrupting” audience’s attention and attracting eyeballs (and/or ears), and have established the first hints of interest our messaging and experiences must aim to persuade that a service, product, or, yes, brand is worth creating a relationship with. Years ago the concept of looking at brand/customer interactions as conversations intended to persuade was cleverly applied to online user experience design challenges as “persuasion architecture.” This took the form of developing website experiences in a non-hierarchical way, so instead of building a site from the top down, which too often mirrored the structure of an organization (company>brands>products & services>product) rather than the way customers explored their needs (search>search results>product) and the questions they were seeking to answer. Practitioners of this approach, notably industry heavyweights Bryan and Jeffrey Eisenberg, designed experiences to provide answers to questions they would anticipate from customers and prospects exploring a product or service need. So if someone searched Google for “accounting software” and landed on a product page, the designers of that page would consider what questions a shopper would have when viewing the page and provide content or clear pathways to answer those questions. What operating systems does it work on? Is this for personal or business accounting needs? 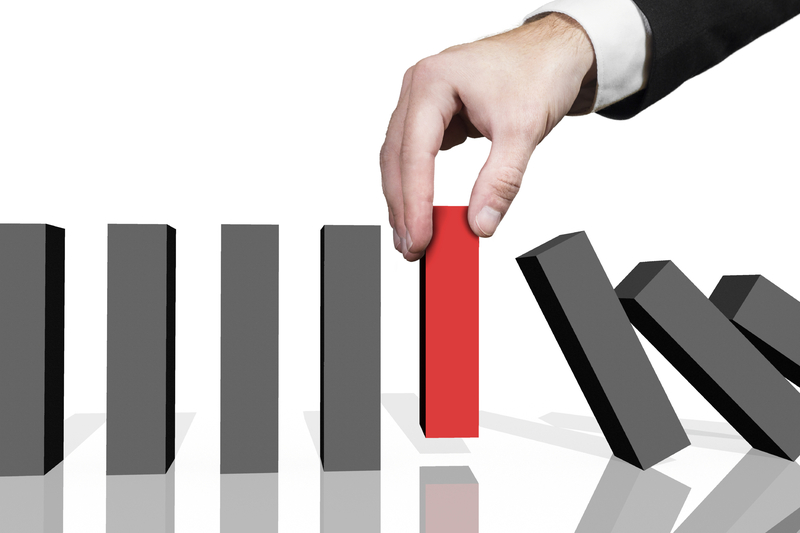 Can I handle invoicing, payments and receivables with the software? These are all examples of questions shoppers of accounting software would likely seek to answer. 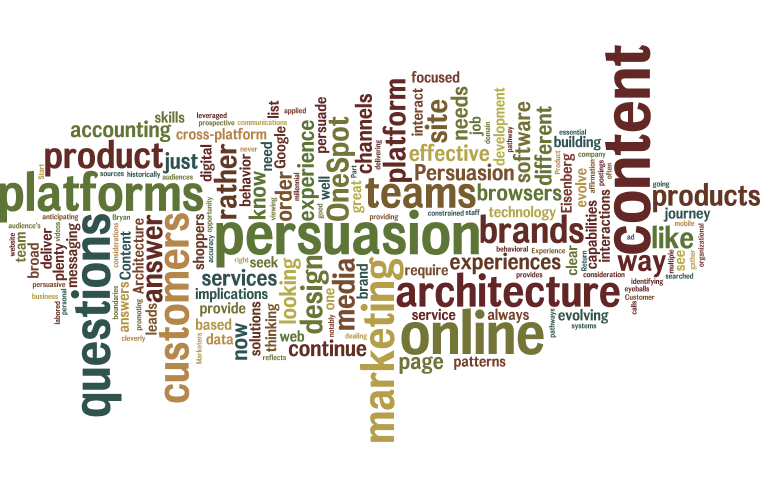 Persuasion architecture thinking was and is a great way of delivering a site experience and identifying content needs in a user-centric way that leads a prospect along a clear pathway toward a transaction. In part the content marketing revolution reflects a broad recognition that brands have not done a great job historically of providing answers to questions through case studies, articles, and videos that show the benefits of products and services rather than just showing a picture or list of features and then offering an order button. 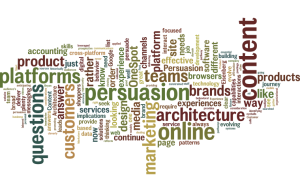 But of course online audiences rarely feel constrained by the boundaries of an individual site domain and rather seek to interact with multiple online sources and platforms to continue their investigation and gather affirmation that a particular product is the right one for them, so persuasion architecture purely in the context of site development is an incomplete answer. This is where implications for how marketing teams may need to (again) evolve and organize themselves in order to be effective should be acknowledged. It can appear expedient to separate the thinking and people focused on online platform development from those focused on media messaging and distribution considering that the tools leveraged within those disciplines are very different. I know plenty of UX leads who neither know nor care to know what goes into an insertion order and plenty of media planners who lose consciousness when asked to review wireframes, but for the purposes of building a modern persuasion architecture the skills of both teams are required. Improving cross-platform identification technology provides the landscape where the principles of persuasion architecture are going mobile… And social… And just about anywhere customers interact with the internet. Customer behavior has always been multi-channel and multi-platform. New tracking and data solutions capabilities are now allowing experience design (very broadly speaking) to be as well. Facebook and Google do an effective job of tying together your cross-platform journeys, which is why that pair of pink pants you once looked at keep appearing in your feed, and data solutions providers like Neustar, Nielsen, and Merkle proclaim the ability to map customers to a broad database of online interactions with a high degree of accuracy. Retargeting shoppers with images and logos of the products they recently reviewed is just step one of applying that technology. Emerging content marketing platforms like OneSpot (who list the aforementioned Eisenberg brothers as advisors) are starting to gain traction in demonstrating the value of looking at media as an extension of the consideration journey that good web platforms have always labored to deliver. Marketers now have the opportunity to continue answering questions they expect prospective customers have beyond their owned platforms. OneSpot calls this content sequencing, which is the notion of anticipating content browsers want to see based on online behavioral and demographic patterns, and serving that content up on different platforms and channels – wherever a browsers’ online journey takes them. Right now Adam Weinroth, CMO of OneSpot, sees its platform as being most effective when their algorithm serves content to web browsers based on engagement patterns rather than how a brand would like to see customers explore their offerings. But the Ambililty team wonders if a potential source of revenue for OneSpot and companies like it could be brands looking expansively at persuasion architecture and where customers explore their options online. That, again, would require brands to unify (or, at least, align) their platform and media teams around the fundamentals of persuasion architecture. The Ambility team recognized in eMarketer’s “Q2 2015 State of Video” further demonstration that video as a form of web content is exploding. The report cites a wealth of factors driving the increased consumption of video online (including the proliferation of original video content on platforms like Hulu, YouTube, and Amazon; and consumers opting out of cable packages in favor of digital) and highlights important implications from the trend that are essential for marketers and hardware developers like us to absorb. The online trend toward video viewing is now undeniable. Engagement levels with social platforms have been long recognized, but after tying social media in 2014 when it comes to average time spent per day, in 2015 video pulled ahead. Users are spending an average of 1:55 with digital video each day versus 1:44 with social networks. When we look at all listed digital platforms digital video not only trumps social networks but also digital radio, Facebook, and Pandora. The embrace of digital video and the extensive time spent per day interacting with long and short form pieces will surely have implications for channels and the devices through which users choose toaccess the internet. Desktops are great for video in certain situations – namely, while you’re sitting at a desk – but increasingly users are instead opting to use more mobile devices for video viewing. Tablet usage for video, for example, has increased at an annual rate of 120% since 2011.
Business and marketers are catching on to this trend and the volume of videos produced for business purposes is also increasing. This goes well beyond pure marketing content and there is every reason to expect its growth to continue. According to GoAnimate, 60% of visitors prefer watching a video to reading about a company. Key West Video says, video “directs users to what to pay attention to first.” Viewers are three times more likely to click on links if there is video involved. As corporate content of this type is increasingly available in video format users will increasingly seek it as a more efficient way to get their business questions answered, and our multi-tasking culture will seek to consume that content on their ubiquitous mobile devices while they plug through their daily tasks. There’s an old saying that war is months of boredom punctuated by moments of terror. It’s likely that someone has said something similar about the marketing world (particularly if they’ve spent time within agencies) but situationally there is no justifiable metaphor between battle and the world of marketing. There are, however, perhaps some lessons marketers can learn from those who practice combat well. Beyond the rigorous physical training (including the Seals’ famous, though studiously unconfirmed, Hell Week when trainees must run, swim in cold water, and crawl through mud almost non-stop for up to six days with only a total of four hours sleep during that time to restore them) the bulk of time spent in elite fighting forces is dedicated to practicing scenarios again and again on the off chance that the same or a similar situation will be confronted. In fact it would not be a far reach to suggest that the mission success of these elite fighting forces is as much about anticipating a situation and preparing for it as it is about training their minds and bodies to function under duress. And here is where marketing teams can look for lessons. The greatest opportunities for marketers to surprise and delight in the social spaces on a mass scale come from being prepared to respond quickly during events that have mass appeal. The Super Bowl, of course, is an example of something people schedule their day (even year) around, but what can be overlooked in this age of time shifting TV watching is that there are plenty of events that Americans seek to enjoy live; events that appeal to our desire for collective engagement, where the very timeliness of social networking can stand out and create mass impressions. The examples of corporate posts or tweets that achieved mass awareness during such events so far are very few indeed, but those that have are less examples of amazing creative than they are operational success stories. That so few brands even appear at all with timely social messaging around mass events is also more an operational failure than a lack of creative juice. Oreo’s “You Can Still Dunk in the Dark” post during the 2013 Super Bowl after the lights kicked off and delayed the game for over a half hour is a great, though unique, example of when the preparation and creative action came together to take advantage of an unexpected situation and gain enviable positive brand perception. No one, I think, has suggested that 360i (Oreo’s social agency) anticipated a loss of power to the 2013 Super Bowl but they did recognize that America’s biggest sporting event offered a real opportunity to make a positive brand impression at relatively tiny cost. All these years later there are arguments about how well that tweet drove business for Oreo. Oreo’s sales growth has indeed gone from the low single digits to around 20% per year for the last couple of years, but a lot of that is explained by expansion into emerging markets. More notable is that it remains an exception all these years later. It’s clear that this is due not to a lack of creativity on the part of brands and their agencies, but rather the lack of effort in anticipating opportunities and streamlining operations around mass events. Don’t get me wrong, the meat and potatoes of social engagement for brands is rightly focused on problem solving. In both Gizmodo and HBR’s rankings of brands that practice social media well, they focus more on companies’ use of social networks as customer service channels than brand messaging platforms. The heavy lifting social engagement provides through almost one-to-one exchanges when problems or questions are posed is a very effective way for brands to show what they stand for, gain valuable customer and product insights, and are great opportunities for turning bad brand experiences into positive ones. LinkedIn’s CEO, Jeff Weiner, who frequently engages with customers and his development team publicly on the platform, wins compliments on his posts responding to user’s comments, exhibiting both a high level of executive engagement with the core product offering and pretty effective brand-building. But social channels as mass media branding mechanisms is still a largely unexplored opportunity. Some of the slowdown in sales growth can be attributed to the fact that tablet users aren’t replacing these mobile devices as actively as they do their smartphones, so after massive rates of adoption since the introduction of the iPad five years ago a slowdown should have been anticipated. 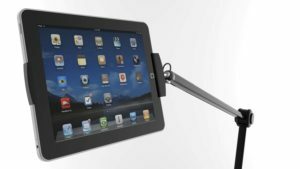 Considering that the features added with successive releases of the iPad have been limited in terms of hardware advances and you have an environment where users are not compelled to trade up to the latest model. “We continue to get feedback that tablet users are holding onto devices upwards of four years,” wrote analyst Ryan Reith of International Data Corporation (http://gadgets.ndtv.com/tablets/news/tablet-market-slumps-as-buyers-find-alternatives-idc-758976). 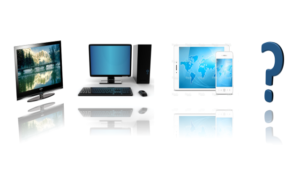 We have long viewed tablets as extremely valuable devices for the home and office but recognize that hands-on or desktop usage only accommodates a subset of the overall use cases they are capable of effectively addressing. Yet the level of development for both apps and accessories for tablet-specific usage is limited compared to that for smartphones. According to Econsultancy 61% of companies report building apps specifically for iPads and 46% for Android tablets versus 86% of companies that are building for iPhones and 84% for Android phones. An Amazon search for “iphone accessories” yields 60,673,582 results while a search for “ipad accessories” returns 8,566,193 listings. Development for tablets is clearly of secondary importance, potentially leaving new solutions opportunities unaddressed. The introduction of the iPad Pro and market adoption of the Microsoft Surface, however, show that the market is starting to appreciate the business related use cases for tablet computers. According to CXO Today Windows tablets are wooing the enterprise. In the Mobility Index Report published by Good Technology, Windows tablet adoption is reported to have increased 400%, from the last quarter of 2014 to the first quarter of this year. (http://www.cxotoday.com/story/are-tablet-pcs-failing-to-impress-business-users/) This is largely driven by the business apps on offer through the Surface and its Microsoft Suite, and iPad apps are slowly catching up. Add enhanced positioning solutions and hands-free interaction capabilities like voice control and look for tablet sales to regain their momentum in the consumer space as well. Posted on November 17, 2015 November 17, 2015 Categories Disruption, Product Management, Tablet computer, UncategorizedTags android, ipad, tabletsLeave a comment on Tablet Sales Declining? We all – at least those of us of a certain age or proclivity for Stanley Kubrick movies – remember Hal. The Hal 9000 was the on-board computer in the 1968 Kubrick classic 2001: A Space Odyssey that the hero interacted with by voice alone. For display, Hal only offered one red eye that glowed with unvarying consistency. A toggle switch that indicated only that “I’m on,” even when Dave very much wanted it off. 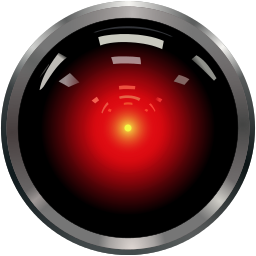 Ignoring the sinister nature of that particular example, how close are we to having a Hal-like assistant that we can turn to for the complex or mundane challenges of our home and work lives? If development and investment activity are any measure then very soon we should indeed be surrounded by devices that will respond to our voice commands more quickly and more helpfully than those voice command systems companies use to provide “customer service” when we call them. These new voice controlled systems promise to provide interactions that not only recognize what we’re saying, but can serve up articles, images, and video from any source connected to the internet and feed them back to us immediately – and in high-def. And they recognize what we want without prompting us to “say or press 1” first. They proclaim to understand what we want based on how we’d ask for it as if we were asking a friend or colleague – but promise a more informed response. The Ambility team has more than a passing interest in this trend as we hold intellectual property in a solution for flexibly positioning tablet computers, and with their mobile connectivity and rich display capabilities tablet users seem destined to be one of the main beneficiaries of voice controlled computing. 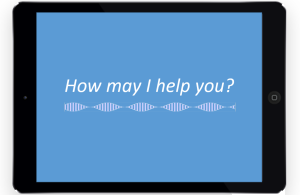 When smart, digital assistants can be provided hands free, the value of hands-free tablet use will multiply. 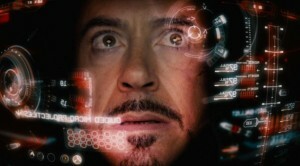 Unlike the Hal 9000, tablets don’t provide an unblinking red light in response to your queries. They provide whatever best satisfies your need. After all, a voice can provide words in response to what you want, but a picture speaks… Well, you get the idea. It seems clear that we are still at the very beginning stages in the world of voice controlled computing and significant barriers stand in the way of widespread adoption – standards of interaction for needs beyond straight searching and integrating voice commands into popular software and applications are just two. 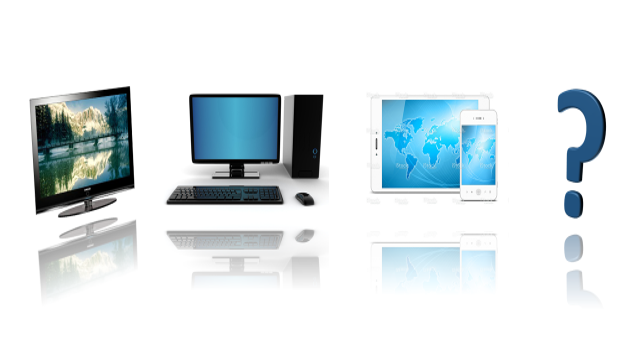 But it also seems clear that voice controlled interactions will help to multiply the use cases tablet computers can satisfy at home and in the office. And solutions for positioning tablets for hands-free use across those use cases will become more and more valuable. Part 1 of this post described some of the systemic attributes of a business landscape where technological change and the dynamics of the marketing agency world combine to create an environment of disruption. Part 1 also described some of the advantages brands should expect when they take their interactive activities in-house rather than working with agencies – particularly in the forms of internal ownership of the customer journey and responsibility for buyer behavioral insights. Part 2 suggests the elements of the disruptive environment that are essential for internal digital teams to recognize and build into their own processes to ensure that the benefits of in-sourcing (or stable agency relationships) don’t come at the loss of the benefits of disruption. Borrowing Georgia Congressman John Lewis’s “Good Trouble” directive, for digital professionals it is useful to recognize that certain types of disruption are good and necessary. While challenging, customer environmental disruption is a given. New hardware, software, and apps are put to use differently by empowered consumers and businesses everyday – well beyond the planned intent of the tools – with significant implications for marketing and service delivery groups (at least). More recently we’ve seen Google+ fail as a replacement social network and hub for all things Google but it seems likely that components will continue as customers demonstrate appreciation for their photo storing platform and its Hangouts for communications (http://www.wired.com/2015/03/google-knew-dead-google-still-social-network/). I have two clients who seem to meet only through the Hangouts, even with people in the same office, keeping them at their desks and minimizing ineffective time moving between rooms. The disruptive environment often inherent in an agency client relationship is partly based on regular review cycles that bring new agencies into the mix, performing research and submitting new ideas for how to better connect with and serve customers. Even incumbent agencies in the review process take a step back, reassess the marketplace, and eagerly search for new ways to delight and surprise. The disruption your internal digital department needs most is not in changing personnel but in getting a renewed understanding of the target customers and their use of new and evolving tools. The environment is dynamic enough that every digital department should develop processes for regularly renewing their views and then openly brainstorming messaging and solutions to better serve their customers. For every digital professional building platforms and campaigns nowadays it is essential to continually evaluate planning activities to understand how well they inform greater understanding of the customer and how the interactive environment that serves them has evolved. The inputs to answer these questions differ by sector as the digital environmental disruption is incredibly varied. Salesforce is transforming how partnerships are marketed, created, and managed in the B2B space but has little impact in helping Starbucks sell coffee. The internet of things has already provided huge benefits to heavy industry but, so far, has had limited impact on retail customer interactions (expect that to change soon). Developing your own map of the players and technologies impacting the online experience of your specific customers is essential and not likely something you can buy off the shelf. It has to be built into a regular planning process. Although the speed of change also varies from sector to sector, it’s hard to conceive of a marketplace whose interactive landscape isn’t disrupted at least once a year. Planning cycles should be scheduled accordingly. All in all, whether you work with outside agencies or not the interactive planning process must be disruptive – to your marketing, your interactive platforms, and yes, when necessary the skills and capabilities of your organization. Attention to the practices and behaviors of your customers will guide the way. Agencies can be a great way to augment capabilities and produce fresh insights and ideas, and their clients are better able to assess their agency and internal needs when they disrupt their own thinking about their customers. Subsequent Ambility posts will further discuss disruption in its many forms – the operational implications of technological disruption to platform and campaign managers, how agencies are and need to continue evolving to sustain the value they offer to their clients and their stakeholders, and the essential skillsets necessary in leaders and teams to keep digital planning activities relevant, just to name a few.